Which Way Did She Go, and What Means What? The Point Is: crystals don't work 'for' you - you don't have that kind of power. They will work WITH you, when you ask, when you are willing to clarify yourself and align with their energy to amplify your aims. AM I GETTING THE ONE IN THE PHOTOS? -The very one! And after your purchase is completed, the listings are removed to the 'Spoken For' Sold Archives page. IS IT POSSIBLE TO SEE MORE PHOTOS? -Email us. Since our store set-up permits only two per listing, we've often taken at least one extra. WHY DO MANY OF THE PHOTOS SHOW A RULER? -So that you have some sense of scale, and as a reminder to you to sketch out the sizes in the listing. Whether you are choosing crystals for your jewelry work, collecting display space, altar or pocket size carry-ability, you'll know what you're ordering when you're able to measure. -Now, there ARE 'standard' specimen sizes: Thumbnail = less than 1-1/4" square; Miniature = 1-1/8" to 2-1/2", Cabinet = over 2-1/2" to 4"; and Large Cabinet = over 4", but we don't consider these to be useful and rarely use them. -Large to us is over 2 POUNDS, and Big larger than that. I'VE BEEN LOOKING FOR CRYSTALS WITH SPECIFIC ATTRIBUTES - MAY I SEND REQUESTS? -Absolutely! If they're here, we'll list them for you under your name for your consideration. 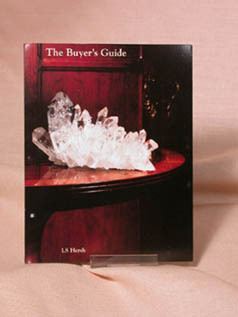 -A rock crystal, or merged quartz group can be both...no quartz crystal fits just one category! However, many crystals are mis-labelled. A skeletal crystal has chambers, or voids, inside from evaporated water or from how it was forced to grow. A true elestial is a crystal with a rare regrowth pattern of small triangle surface voids. Much of what is called 'elestial' on the market today would be correctly named 'parallel growth' - a series of crystals in layers which have grown parallel to each other. WHY IS ROSE QUARTZ PINK, AND LAVENDER...LAVENDER? -Many analyses point to titanium and iron inclusions as giving the familiar pink rosy blush. Lithium added to this gives a lilac to lavender cast to this rare rough. -Are varying shades of champagne to yellow to orangey from included and sometimes occluded iron. This term applies to rock crystals and clusters, and only to those which exhibit the coloration after they have been acid-cleaned, retaining the coloring. Our stocks are from the type locality: Collier Creek Mine, Arkansas. -Most of the quartz crystals we all see are 'normal': six prism sides, six faces at the point. Anomalies such as 8 faces [or more], phantoms [white are the most rare], cathedrals, true Dow, selene veil crystals are amongst the extremely rare. We go: uncommon, rare, quite rare, and extremely rare to attempt to keep it simple. -Similarly, A+ is our highest grade for clarity and overall condition. A string of "A's" doesn't make it any better, just louder. The same natural forces which can force a crystal to become curved [quite rare] can of course cause natural damage. What counts towards overall aesthetics and value is if the specimen escaped any 'unnatural', or new damage. We describe so that you can choose, saying 'no damage' where there is none that's been man made. Many metaphysical tomes advise 'cleaning' or 'clearing' your crystals by leaving them in the sun. Naturally colored, and heat treated stones as well, will LOSE their color. Don't display your amethysts, rose quartz, smoky quartz, yttrium fluorites etc. in the sun or leave your clear quartz where it could overheat and possibly start a fire.